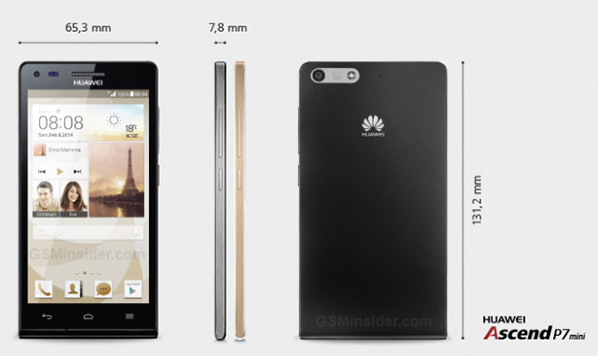 Chinese manufacturer Huawei has just announced the Ascend P7 mini, a smaller version of the still unannounced Huawei Ascend P7. Usually manufacturers first introduce their full size models, so it will be interesting how this decision will affect Huawei's sales of their newest flagship. The Huawei P7 mini features a 4.7 inch TFT display with in-cell technology, which allows the manufacturer to make their device thinner. It also comes with 8GB of internal storage which can be expanded by an additional 32GB microSD storage. You also get an 8MP rear camera, a 5MP front camera, Category 4 4G LTE connectivity, a 2000 mAh battery and a 1.2GHz quad-core Snapdragon 400 processor with an Adreno 305 graphics chip and 1GB of RAM. On the software side the device runs Android 4.3 Jelly Bean, which has been customized with the Huawei Emotion user interface. The device was introduced in Germany and is expected to be available in Europe soon. Pricing and exact availability dates were not disclosed, but it is expected to cost between 250 and 300 euros.